Disgraced FBI director James Comey joins the growing list of political fat cats set to rake in millions from the notoriety they gained by obstructing President Trump. 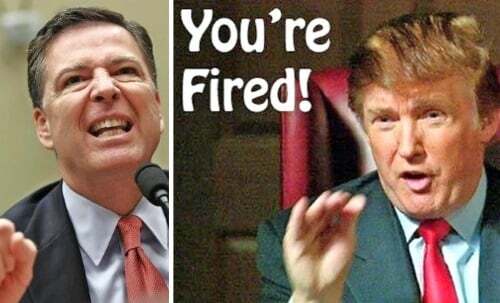 Comey is reportedly being wooed by the publishing world following his high-profile firing and unlawful leaks to media outlets like the New York Times. Editors are prepared to offer him a book advance of $10 million to dish dirt on Trump and Hillary Clinton. While a career politician being fired hardly sounds like an intriguing story line, Trump’s undisputed star power has made James Comey a household name. An acquisition editor for a top New York publishing house said Trump’s feud has elevated Comey so much that his firing will provide the ultimate golden parachute to subsidize a lavish retirement. I know one top-drawer producer who’s already talking to stars to cast the Comey role. He has to be tall, good-looking and a Jimmy Stewart-John Wayne-hero type. I was mesmerized when I spent the whole day watching Comey testify. Comey could expect a movie deal tied into the book worth many millions of dollars more, tens of millions. Comey’s sudden elevation is being fueled by the left-wing media’s fawning portrayals of him as a martyr after Trump fired him. Ironically, Democrats and the liberal media had viciously slammed Comey for months after his July 2016 press conference where he criticized Hillary Clinton’s gross mishandling of top-secret government intel (see video above). At the time, many liberals demanded that James Comey be fired. But when Trump did fire him, they predictably sided with Comey in a knee-jerk reaction to undermine the president. Comey obviously learned a lot by watching grifters Bill and Hillary Clinton, who cavalierly used their stints in political office to rake in hundreds of millions of dollars. So it seems the swamp just gets richer while paying lip service to helping the poor.